One of the things about traveling I like the most is running into something wonderful and unexpected. This was the case in Copenhagen. On the way back to the hotel we stumbled on to the Copenhagen National Museum. Jan pulled out a guidebook and next to the information about the museum was picture of the Gundestrup Cauldron. The Cauldron is a masterwork, iconic of La Tene, Celtic culture. It or some part of it appears in literally every publication referencing Celtic art, history, and mythology. It has been used on the cover of 100's of journals and books. It was something that I had to see. 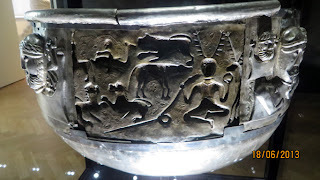 The great cauldron did not disappoint with this caveat: the cauldron, which has become symbolic of Celtic culture, is an enigma, because its true origin and purpose are unknown. In 1891 the priceless silver artifact was discovered while digging for peat in the Raevemosen Bog in Himmerland, Juteland. The cauldron was dropped into the bog—perhaps as a valuable sacrifice to the gods sometime between 200 BC and 300 AD. which is a very broad range. 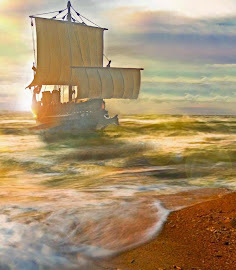 The images depicted on it come far away from the northerly realm where it was found. Elephants, lions and several gods represented in a foreign style indicate that the cauldron had its origin in remote areas south or southeast of Juteland. Exactly where it was made or how it got to Juteland is unknown. It could have been commissioned, traded, or stolen. But surely it was the prize possession of a great chieftain or priest and used for ritual drinking and feasts. Most researchers agree that the vessel portrays elements of La Tene workmanship and that is why it is used in most books and articles that reference ancient Celtic culture and art. I am not the expert, but it seems to lack the spirals, curves and entwined art elements that signify La Tene motifs. 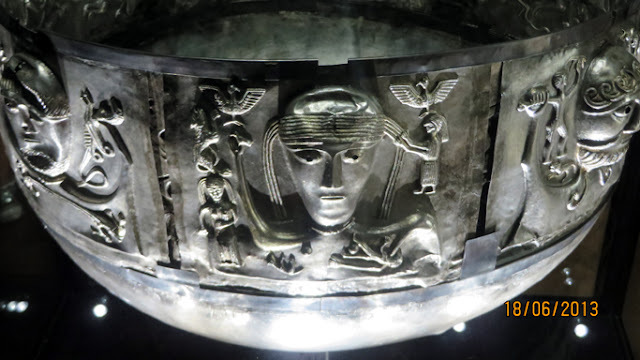 The predominent heads on the sides of the cauldron seem very classical. A plaque on the exhibit stated that the technology to produce it did not exist in northern Europe or Gaul during the range of time it was created and suggested it may have been produced in Thrace where working with silver flourished. The relic is a good example of the elusiveness of pinning down a definition of Celtic Culture. Still, it is one of the most remarkable artifacts I have ever seen, dazzling and spellbinding. Filled with potent drink, it would be a “goldmine” of inspiration for any ancient chieftain or even a golf buddy. Thanks for yet another very interesting topic. I always enjoy these posts.